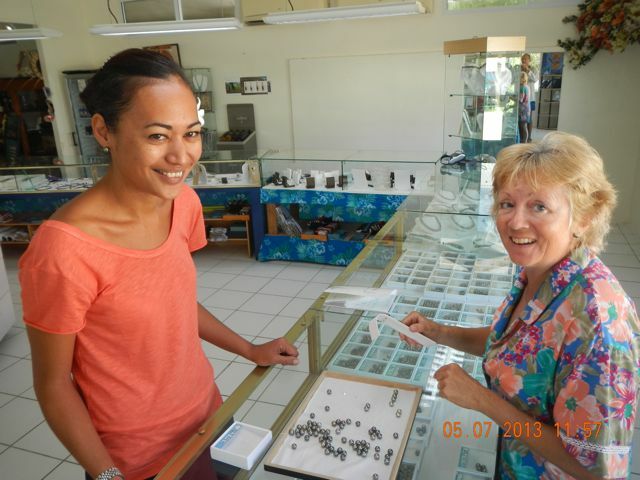 We re-visited the Gauguin Pearl Farm to buy gifts for other people. Here are a few scenes of interest. 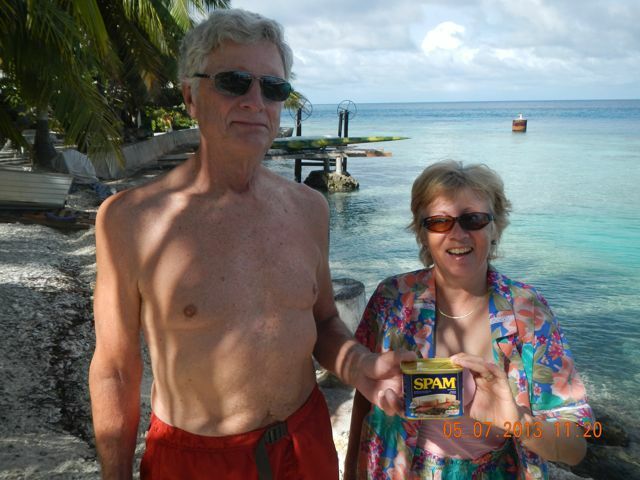 Evidently, Chip is a follower of Mr. Whitekeys, so the requisite Spam photo had to be taken. 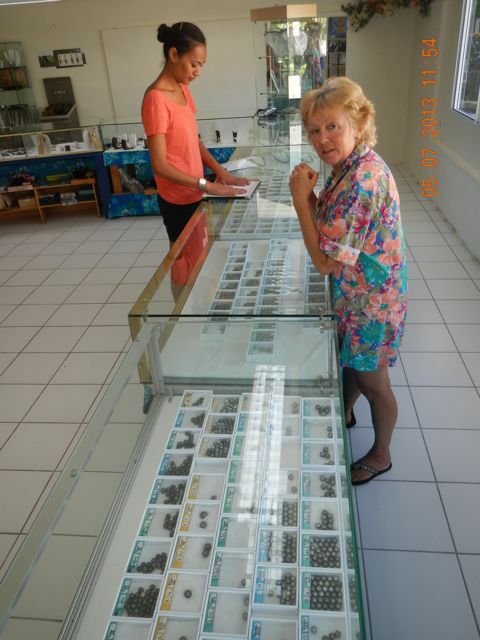 Conni shops for more pearls out of the thousands in the cases. Tihei (Te-hay) was our guide and amazingly well-versed in black pearl knowledge. She could answer every question and was so very kind and polite to us. With 25 years of production, there have been exactly TWO natural pearls found at Gauguin. With all of the pearls we see in old crowns and church gowns, how could the percentage be so low? Genetic drift! These days, good pearl producing oysters are seeded up to three times, producing three or even four times. Back then, the good ones were killed to extract the pearls and this lowered production. 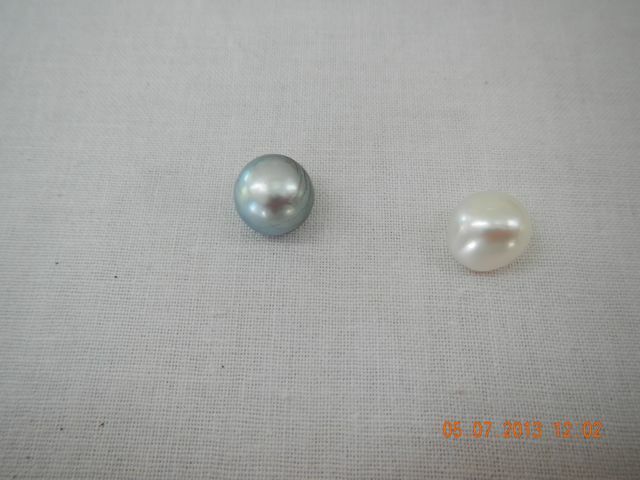 Neither of these two are high quality pearls, especially in comparison to modern cultured pearls. 3771 Euros each: US$4856 each. 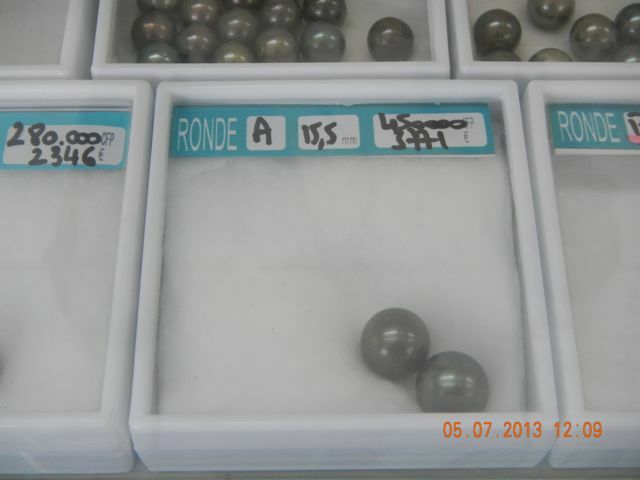 These were the two most expensive pearls that we saw: perfectly round, flawless, and very large (15.5 mm diameter). 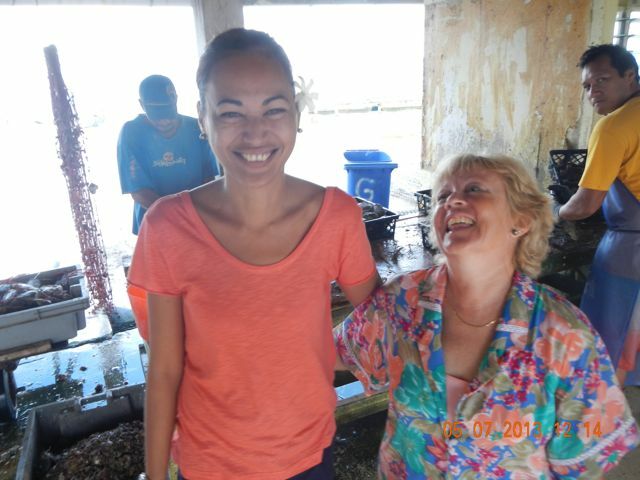 Tihei and Conni pose together in front of the cleaning station. 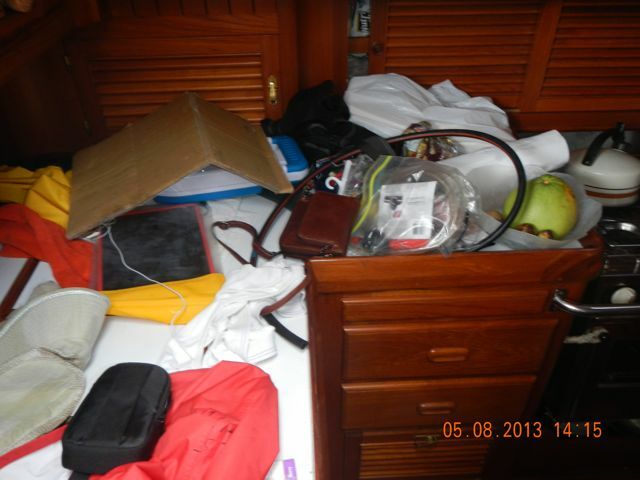 Wings' galley counters full of day-to-day living stuff. 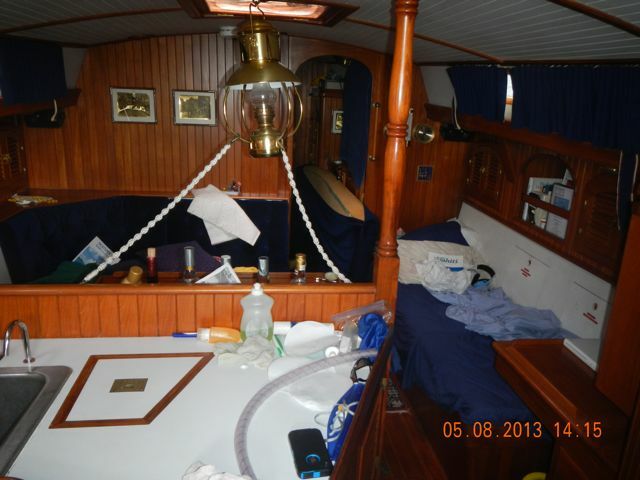 To stay cool, and because the large blue/yellow mass in the doorway, our berth cushion, was soaked with seawater, we slept in the saloon, I on starboard, Conni on port. 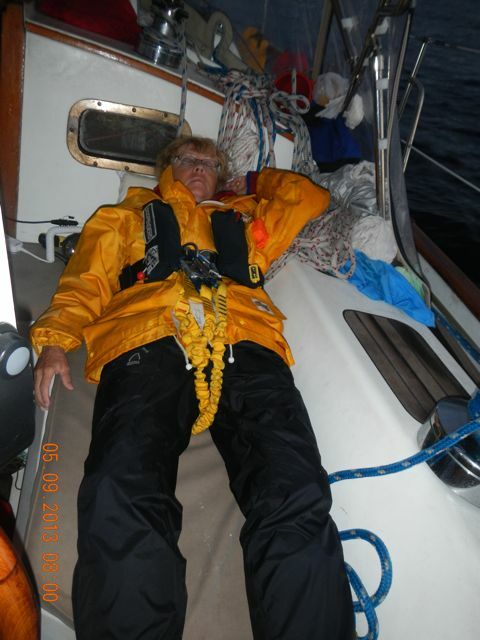 After being awake and stressed for almost 48 hours as we fought the storm that sped us to Tahiti from Rangiroa, Conni sleeps in her foulies. Naturally, she's wearing her life vest and harness.